I was walking Pixel the other day and stopped to talk with my neighbor who was outside pulling weeds - or what he thought was weeds. Turns out he was yanking out a ton of mint that was growing near his front door! Obviously you can make some wonderful mint infused martinis! 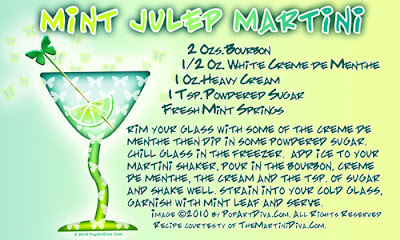 Today I've posted the Mint Julep Martini, a classic southern bourbon cocktail. You can infuse your bourbon and other liquors with mint. Muddled fresh mint is a necessity in a mojito! You can flavor your teas or even coffee with mint. You can create flavored sugars (article on how will be posted tomorrow) for cooking and mixing cocktails. You can create flavored simple syrups for your bar. Fresh mint is great in salads - I love it in a strawberry salad. You can dry the mint and store for use later. Crush up some mint leaves and add to water and you can heat this to infuse your home with mint. You can create scented salts for your bath. Put a few smaller mint leaves in an ice cube tray and fill with water for some fun ice cubes. Perfect for a natural breath freshener! Sprinkle a few mint leaves in the back of your cabinets to keep out bugs! Planting mint around the perimeter of your home will keep the bugs out before they get to your cupboards! Of course, I dragged all his pulled up mint home - my mother always said "Waste Not, Want Not"! 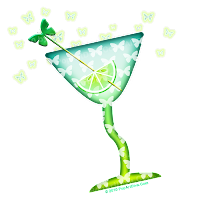 Like this GREEN MARTINI DESIGN? all fully customizable and personalizable!